"This unique pie is bursting with bananas flavored with pineapple juice and cinnamon." This pie was rich and sweet. It tasted great warm and even better cold. Simple, easy, and tasty. AWESOME!!!!! 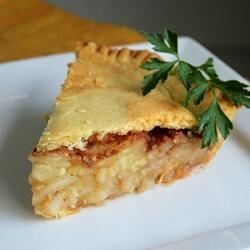 If you like bananas, pineapple, and sugar, this is a slice of heaven in a crust! Got rave reviews at a Hawaiian 4th of July celebration!! !